It was the bleak heart of the Howard years, and the height of the Children Overboard affair, when I first encountered the story of Edward Cole. I was immediately struck by the energy and flair of a man who led a life unconstrained by convention or public opinion. In 1883 he opened Cole's Book Arcade in Bourke Street, a three-storey fun-house filled with books, novelties, optical illusions, a fernery, talking birds, monkeys and a brass band. People were encouraged to read in elegant cane chairs on the ground floor, thieving was tolerated (to crack down on it might have scared off genuine readers) and no one was moved along or pushed to buy. Edward understood the public's tastes, and the Arcade flourished, but he also challenged public perceptions that he believed were false or harmful. During the 1890s depression, when anti-Chinese sentiment was running high, he opened a Chinese tea salon inside the Arcade, and hired Chinese waiters to staff it. He opposed the introduction of the White Australia policy, and campaigned publicly against it, at a time when most Australians (and his customers) enthusiastically backed such policy. I was struck by his optimism, by his willingness to fight for values that were clearly unpopular. The truth was, although I was appalled by the political climate under Howard, I felt powerless and apathetic in the face of it. So I was captivated by Edward the unwavering idealist, a man convinced that the actions of an individual mattered, and could change society for the better. In researching the facts of Edward's life, I discovered a rich vein of stories: how he made money on the goldfields by selling lemonade, spent four months on the Murray River in a small rowboat, and advertised for a wife in the newspaper. But I wanted something the historical record could not provide: access to his internal world, and the source of his inexhaustible idealism. This is the realm of fiction. Only by writing fiction could I approach the interior landscape of doubt, hope, guilt, desire, love and grief we all carry within us. Yes, I had to imagine this landscape, to make it up, if you like. The result is a portrait of a generous and sometimes foolish visionary unafraid of being himself. I made it up, and yet I can't help feeling the spirit of the real Edward Cole hovers closely around this portrayal. 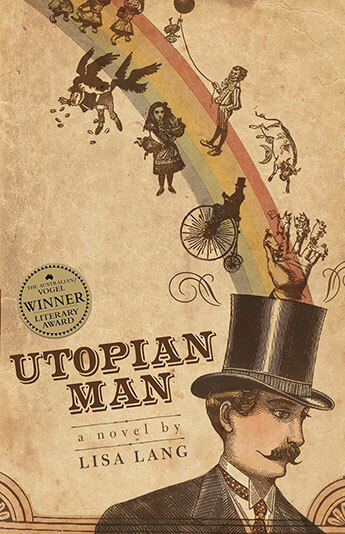 People have told me they found reading Utopian Man an uplifting experience. It feels good to have put something positive out there, to have in a small way, perhaps, kicked against apathy. This article first appeared in Readings magazine.